MANGUS COLORADO part-bred ¾ Akhal-Teke ¼ Thoroughbred is 15.2 hands tall and is the most traveled of the Nez Perce horses. Mangus has been with the Nez Perce Tribe at Pincher Creek, Alberta, Canada, the Bear Paw National Battlefield, the Big Hole National Battlefield, the Whitebird National Battlefield, for ceremonies honoring those who lost their lives. Mangus has also been the lead trail horse for Nez Perce Tribe sponsored trail rides at the Nee Mee Poo trail at Mussel Shell, east of Weippe. Mangus has been in the arena during the night show of the Lewiston Round Up, the Pendleton Round Up, the Clearwater, Idaho Parade, and was exhibited in Nez Perce regalia in Snohomish, Washington Mangus Colorado will be appearing soon in HORSE ILLUSTRATED. Mangus has a beautiful leopard spotted colt out of an Appaloosa mare. 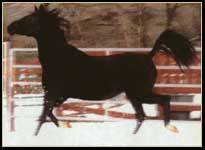 Mangus is also the sire of a black partbred 1996 Akhal-Teke filly. The Akhal-Teke offers size in their foals. The average height is 15.2 hh and 16 hands is not uncommon. The Akhal-Teke is a hot blood like the Arabian and Thoroughbred. Our experience with these horses demonstrates that they are people horses. They do just as well in situations that the best of stallions, of any breed, would do. They are intelligent and loyal. During the " Floods of 1996", when Lapwai Creek crested and there existed the danger of more water coming down the creek, I saddled Mangus ( he was closest to the door), rode him through a group of mares, not a normal thing to do and rode him into the swollen Lapwai Creek and herded, into the water and to higher ground, a group of seven yearnings perched on a small island. The water at that location reached my stirrups and because of the emergency situation the normal routine of riding a precious and rare horse was drastically altered to face impending disaster. The creek never rose higher and Winchester Dam didn't burst. What did happen was that Mangus Colorado did what I needed him to do. He carried me into deep water and we removed young horses from danger. We welcome you to participate in a new horse breeding program that will give our region national and international acclaim. Breeding Fees begin at $750.00 and horses are available for purchase.